Fans of the Premier League daren’t miss these clashes that will light up the weekend! The Premier League returns and Gameweek 9 has plenty of intriguing matches on offer but what are the individual battles to look out for? Saturday’s first match of the Premier League is a massive one. Defending champions Chelsea are tottering at the moment while in stark contrast, Watford are flying high in fourth place. However, the Blues showed plenty of spirit in their 3-3 draw against Roma in mid-week and the main man was Eden Hazard, who rescued them with a two-goal burst. The winger, who started the season recovering from ankle injury, has not yet hit top form but against the Giallorossi, showed signs that he’s back to his best. Up against him will be Watford’s Jose Holebas, who has been in fine form, like most of his teammates, this season. The versatile 33-year-old will have to check his attacking tendencies to track back and mark the mercurial winger out of the game. A fascinating battle at Stamford Bridge is in the offing and should Hazard get the better of his man, Chelsea are likely to cruise to victory, but if not, the visitors will make it a difficult 90 minutes for their fancied opponents. Not so long ago, Steven Defour was the toast of Europe but after suffering a fracture, the Belgian never truly recovered his stride and his career has now taken him to Premier League side Burnley. The 29-year-old has been tidy since his arrival at Turf Moor but up against him on Saturday is the man who earned the world’s attention with his stupendous displays, Kevin De Bruyne. De Bruyne’s brilliance has been key to City’s blistering start to the season and the Sky Blues are heavy favourites to romp past Burnley at the Etihad. However, should Defour be able to shackle his compatriot, there could be a twist in the tale. Let’s not forget Burnley are in seventh place currently and Sean Dyche’s men will not go down without a fight. Even as Southampton seem to have gotten over their goal-shyness, West Brom seem to be struggling to keep a clean sheet in the Premier League. The Baggies, winless in their last seven games, travel to St Mary’s Stadium knowing a loss would see them drop to the bottom-half of the table. For the 11th-ranked Saints are just a point behind West Brom and will be relying on Manolo Gabbiadini to fire them to three points on Saturday. The Italian roared back with a brace against West Ham and it seems the players are now adapting to manager Mauricio Pellegrino’s methods. However, the fact remains that you can’t win if you don’t score and the man tasked with marking Gabbiadini will be the oft-criticised Jonny Evans. The Irishman, who almost moved to Manchester City in the summer, has benefitted from having Ahmed Hegazi as his defensive partner but the unpredictable Gabbiadini can prove to be a handful so this battle is anyone’s guess. There is no ‘Wembley Curse’, but nobody can deny that Spurs have been excellent travellers while they have struggled to perform at home. And so has their star striker Harry Kane. The in-form Englishman has scored nine times away from home but just twice at Wembley. However, up against him are a Liverpool side that still are suffering from a multitude of defensive issues. Set-pieces, open plays, you name it and the Reds are susceptible from any end. One player who has come under criticism in recent weeks is Cameroonian centre-back Joel Matip. Normally reliable, the defender made a glaring error in Liverpool’s draw against Newcastle and while he was solid against Manchester United last week, the Red Devils weren’t really adventurous. Spurs are among the most vibrant side in the Premier League and will look to batter Liverpool’s defence at Wembley but will Kane be able to get the better of Matip? Keep an eye out for this match-up on Sunday. After 15 years, Wayne Rooney is at the venue and up against the team his legend was born. As a fresh-faced 16-year-old, the Everton striker scored a memorable goal against the Gunners to get the Goodison Park crowd off their feet. This time round, however, Rooney is no longer an unknown quantity. And the Toffees continued struggles this Premier League season have seen many calling for manager Ronald Koeman to get the sack. However, should Everton beat the Gunners at Goodison, they could still salvage their season. Key to their fortunes will be talismanic striker Rooney. 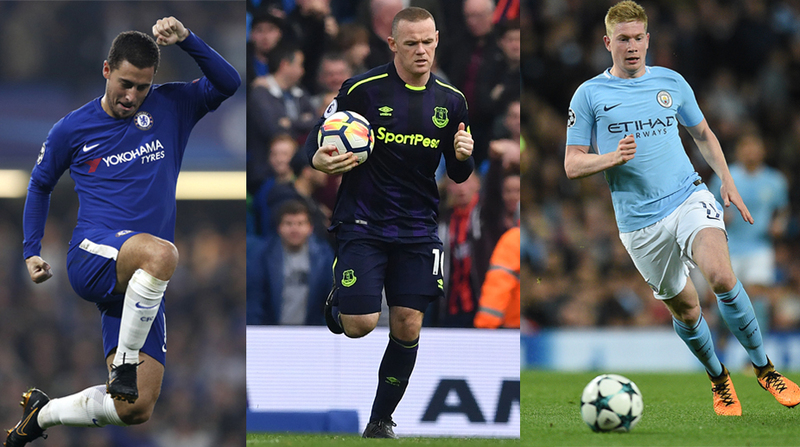 Back at the club where he became a star, Rooney is the top-scorer for the Toffees but their poor goalscoring record is not saying much. He’s always loved playing against the Gunners, but with an disturbing lack of cohesion in the Everton attack, will he be able to do it again? Up against Rooney will be Laurent Koscielny. The French defender, who prefers a hands-on approach, has a knack for imploding in big games but if he is able to keep his cool, he can be an excellent centre-back. So with Rooney relishing the physical challenge, will he be able to trump Koscielny once again? Arsenal haven’t had the best of starts to their season as well and will be going all-out to win on Sunday. And this clash may just decide the outcome off the match.